Superminis: Skoda - VW | What Car? Skodas version of the VW Up has many of the same qualities good manoeuvrability, smooth three-cylinder engine and a surprisingly spacious cabin but gets its own look (every body panel is different). It focuses on value instead of baby premium. That means hard plastics on the dashboard and door inserts, and a lower list price. If youre in the market for a sub-10k car, a 500 saving is a major achievement and Citigos will undercut comparable Ups by about that much. There will be three trim levels S, SE and Elegance although the 7500 S model does without air-con or even electric windows. The cheapest SE will be around 8150, though just 150 more than an entry-level Up, making it the logical choice. Three-door Citigos will arrive in June, but Skoda expects 60% of those sold to be five-doors; that variant turns up in August. Toyotas Yaris Hybrid could be the greenest non-electric supermini when its launched in June. Official CO2 and fuel consumption figures havent been released, but Toyota insiders have hinted that the petrol-electric Yaris will be more efficient than the Kia Rio 1.1 CRDi, the current benchmark with 88.3mpg and 85g/km of CO2. The Yaris Hybrid will be powered by a version of the Hybrid Synergy Drive system already used in the companys Prius and the Auris HSD, but it has a 1.5 rather than a 1.8-litre petrol engine. The electric motor can power the car without the help of the engine for just over a mile and it provides some welcome extra thrust away from rest. However, the Yaris Hybrid is generally a sluggish performer, offering inferior acceleration to both the Yaris 1.4 D-4D diesel and 1.33 petrol model. Impressively, Toyota has managed to package the hybrid powertrain within the car without sacrificing any interior space. Therell be a hybrid premium of around 2500, so wed expect a starting price of at least 16,000. 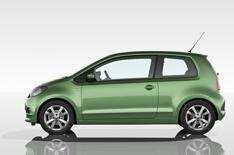 The VW Group is mounting a three-pronged assault on the sub-10k city car market in 2012 with this, the Volkswagen Up, plus versions by Seat (Mii) and Skoda (Citigo). The Up is designed to be the premium offering of the trio. Weve tried both the 59bhp and 74bhp variants, and theres no doubt that the higher-powered model is best for out-of-town motoring. That aside, the Up has a supple ride thatll prove useful in towns, and steering thats light and direct if not as sharp as the Hyundai i10s. The cabin is generally well finished, although the slick appearance isnt wholly carried off; you dont have to look too hard to find evidence of cost-trimming (the hard plastics). It isnt as polished as the Polos cabin but its a notch above the class norm. The interior is surprisingly spacious given the Ups small dimensions, with room for four adults (just) and a boot that can grow to not far off 1000 litres when the rear seats are lowered. Given that the cheapest high-powered Up with standard kit such as air-con or electric windows could top 9k, we can see plenty foregoing the open-road pace and going for a well-specced 59bhp model. If they do, theyll get a smart, capable, surprisingly roomy city car with a decent helping of VW interior finish thrown in.